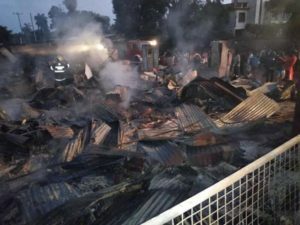 Fire has gutted Madhivani market in Jinja municipality in our latest news in Uganda leaving more than 250 vendors counting loses. The fire is said to have broken out at 2:30am Tuesday morning resulting from a short circuit. It destroyed fridges, food stuffs, merchandise and stalls. Ashraf Musenze, a hair stylist, says vendors tried to put out the fire in vain as it spread fast to most parts of the market. Abdallah Hassan, a vendor of beverages, says it took the intervention of the police fire brigade to stop the fire from destroying the entire Madhivani market. 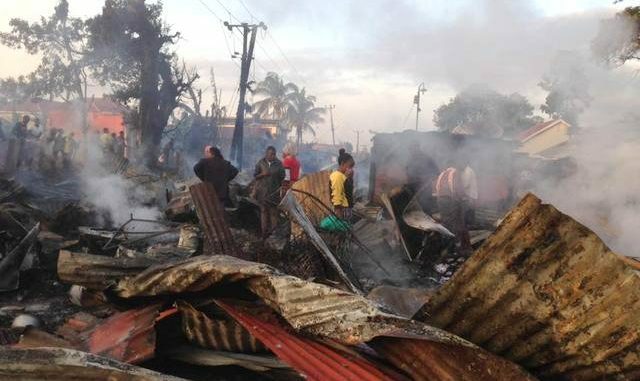 Badiru Mugabi, the Chairperson Madhivani market, says the fire brigade vehicle that first arrived at the market didn’t have water, saying this affected the rescue efforts. Collins Agaba, the officer in charge of Fire and Rescue Services at Jinja central police station, denies claims that they took long to contain the fire. He says they have launched investigations to ascertain the cause of the fire.